It is indeed surprising that as a common condition found in at least one-quarter of patients, chronic constipation is treated in a wide variety of ways, with relatively little evidence-based data, especially regarding dietary fiber, fluids, and exercise. The Facts are that most chronic constipation’s causes are not gastrointestinal (GI) tract itself problems, however, most doctor and constipation prone to abuse the gastrointestinal (GI) tract to get Quick-Relief, and make more and more Colorectal Cancer patients come out. Constipation not a sickness, but kind of digestion related metabolic status, which may be complicated mixed problems connected to liver, kidney, and spleen functions. Constipation is not good to Body Health Status for sure; however, it is somewhat Quasi-stable digestion related metabolic status per Individual’s specific health situation. Human being body itself is the best doctor for human being’s health issue. It could be meaningless try to let a stroke survivor or an aged people’s bowel movement to reach regular healthy young man’s level. To heal, to treat or to lower it with convention medicine may not be the best solution to handle bowel movement, the best solution can only be found per specific individual health situation. the way how to deal with constipation in very well balanced way is important to some of patients under special health situation. Don’t mention possible side-effects, by Complementary and Integrative Health, Simply to apply laxative to constipation patient is like whipping a tired horse to make it exhausted, the best solution to deal with Constipation should be with balanced holistic solution—Complementary and Integrative Medicine, i.e. 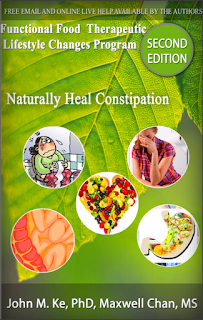 Natural Heal Constipation with Functional Food TLC Program. 1. Like headaches and colds, almost everyone will experience a bout of constipation at some point. For most, the episode is brief and won’t require medical treatment. But if you have problems for three months or longer, doctors start to get concerned. Having fewer than three bowel movements per week, excessive straining, a sense of not being finished, or having hard, lumpy stools are signals you may have constipation. At any one time, some 43 million adults in the U.S. suffer from the condition. Women are twice as likely as men to experience constipation, while seniors who take multiple medications are also at high risk. If you are constipated, it’s worth eating more fiber-rich foods such as vegetables, fruits, whole grains, and nuts. You can also drink more fluids and make sure you exercise regularly. Fiber supplements are another option to consider. Our analysis found that those containing psyllium are best. If those strategies don’t help and your constipation persists for two weeks or longer, you may need a medication to relieve your symptoms. A variety is available in both non-prescription and prescription options. Most people will get the help they need from inexpensive, non-prescription drugs, such as stool softeners and laxatives. "I imagine death to be just like this. I had been taking medicine for an inner ear infection which had me constipated for 5 days and I was experiencing pain from constipation. I didn't realize there was different kinds of laxatives, which is on me for sure! I took 2 pills at 7:30am because that's when I got off work and didn't have work til 4pm that day. They kicked in about 1030am and I was on and off the toilet until I had work. Sweating, burning and watery diarrhea, with cramps 81702037x worse than period cramps. I was okay for a little bit and then at 9pm the pain came back with a vengeance. Still going... cramping, hot and cold & pooping. I started crying I'm in so much pain. NEVER again. I'd rather be constipated!!" Results: The standard advice of increasing dietary fibers, fluids, and exercise for relieving chronic constipation will only benefit patients with true deficiency. Biofeedback works best for constipation caused by pelvic floor dysfunction. Pharmacological agents increase bulk or water content in the bowel lumen or aim to stimulate bowel movements. Novel classes of compounds have emerged for treating chronic constipation, with promising clinical trial data. Finally, the link between senna abuse and colon cancer remains unsupported. Conclusions: Chronic constipation should be managed according to its etiology and guided by the best evidence-based treatment.